The Riviera Nayarit has more than a dozen fantastic attractions offering history, nature, magic, fun, colors, luxury, infrastructure, fiesta, culture, flora, fauna, gastronomy and much more. Here is a list of the 10 Must-Sees in The Riviera Nayarit. This little island is just 3 km (2 miles) from the beach at Guayabitos in Compostela and is home to thousands of colorful fish and coral reefs—perfect for scuba diving and snorkeling. There are also pelicans, seagulls, boobies and more for you to enjoy from under your umbrella on the beach. Its waters are calm and ideal for SUP yoga. This virgin beach is located on the north coast of the Riviera Nayarit less than 100 miles from San Blas on the border with Sinaloa. It’s 56 miles long and it’s known as the longest beach in Mexico, the second longest in Latin America, the third longest in the Americas and the fifth longest in the world. The area belongs to the National Marshes Biosphere Reserve. The Centro Cultural Las Fábricas de San Pancho A.C. is the reason the town is considered the Cultural Capital to the Riviera Nayarit. The warehouses were repurposed and filled with culture, the arts, environmental causes and community development with the Centro Comunitario Entre Amigos at its heart, along with the Alianza Jaguar, the Colectivo San Pancho, the Bodega Teatro and the newer Bodega del Circo de los Niños established by Gilles Ste-Croix, co-founder of the Cirque Du Soleil. La Cruz de Huanacaxtle is the Nautical Capital of the Riviera Nayarit thanks to this marina, considered the largest and most modern of the Mexican Pacific. It’s the only marina in Mexico that has received the Blue Flag certification for its environmental commitment. As if this weren’t enough, it also hosts a series of upscale international events. According to historians, Mexcaltitán is the birthplace of Mexican heritage and where the legend of Aztlán began, the starting point of the seven Náhuatl tribes’ long journey to the Valley of Mexico that ended when they founded the great city of Tenochtitlán. 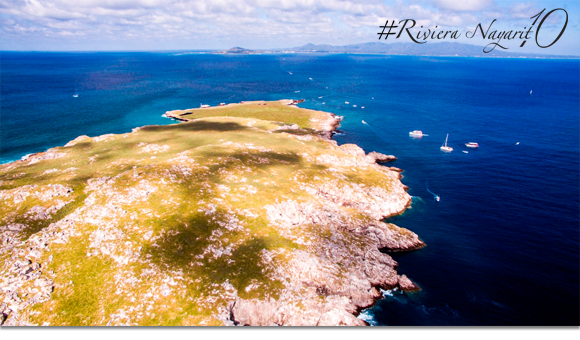 Today the island is home to fishermen, with beautiful scenery surrounded by mangroves and dozens of species of birds. Its gastronomy is unique, as it’s the also the birthplace of the Taxtihuile shrimp and, possibly, the famous pescado zarandeado. This is a Nature Preserve that allows camping, 74 km (46 miles) from the docks at San Blas. The air is filled with frigate birds, but you’ll also find blue-footed and brown boobies. It’s the perfect place for fishing, scuba diving and hiking. Its beaches, the lighthouse, the Monas islets and the long crater are all part of the grand tour. The Punta Mita development in the Glamour Peninsula of the Riviera Nayarit is home to the Pacífico Punta Mita Golf Course, designed by Jack Nicklaus, who famously said Hole 3B—also known as “Tail of the Whale”—is the best Par 3 he has ever designed. It was recently picked as one of the “Top Ten” best Par 3 holes in the world by the UK edition of GQ for being the only green that’s located on a natural island. This is the Riviera Nayarit’s Surfing Capital: It’s hippie chic, it’s cosmopolitan, it’s party, and it’s all about good vibrations… Sayulita is this and much more and it’s currently the Mexican destination showing the biggest tourism growth within the past year. It’s a must-visit. This Natural Protected Area has become the signature icon of the Rivera Nayarit for its spectacular attractions including the Playa del Amor, or Playa Escondida (Hidden Beach), and the Playa La Nopalera, among others. It’s of prime importance to be informed and choose a qualified tour operator to enjoy one of the many tours to the islands. Once there, visitors can not only enjoy birdwatching, but also snorkeling to enjoy the schools of colorful fish that call this area home.